Shake up a coffee and banana with yogurt, ice cream and start your day with energy rich coffee banana smoothie. Learn how to make perfectly sweet and creamy smoothie with a kick of caffeine in this easy and instant recipe. 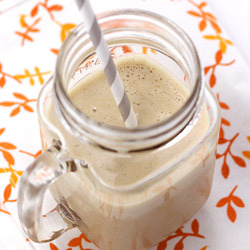 Place banana, brewed coffee, yogurt, ice cream and sugar in a blender. Blend until smooth puree. Add milk and ice cubes; blend again on high speed for 20 seconds. 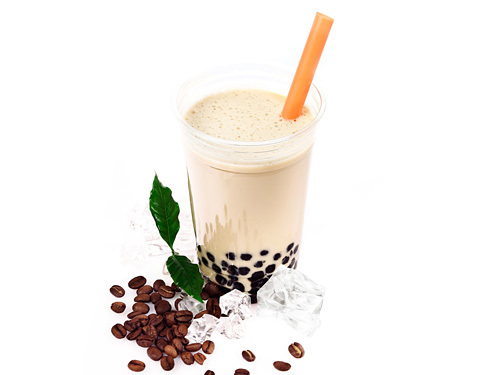 Optionally add bubble tea tapioca pearls in the glass as garnish, fill up glasses with prepared drink and serve with large straw. Pour brewed coffee in ice tray and place it in freezer to make coffee ice cubes. Use them in place of coffee liquid to make an iced coffee smoothie. Serving Ideas: Serve it as a healthy breakfast drink and start your day with the powerful kick of coffee and energy of banana. Have one glass of this chilled drink whenever you feel like having extra energy to keep going for rest of the day.